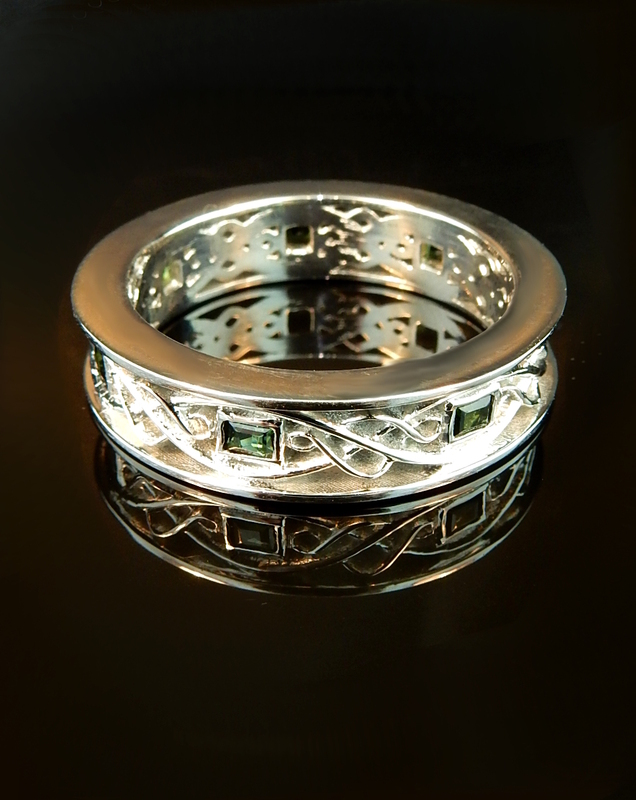 This beautiful creation was hand crafted by our master jeweler and CAD/CAM expert. This wispy design is sure to draw attention due to it's originality and creativity! 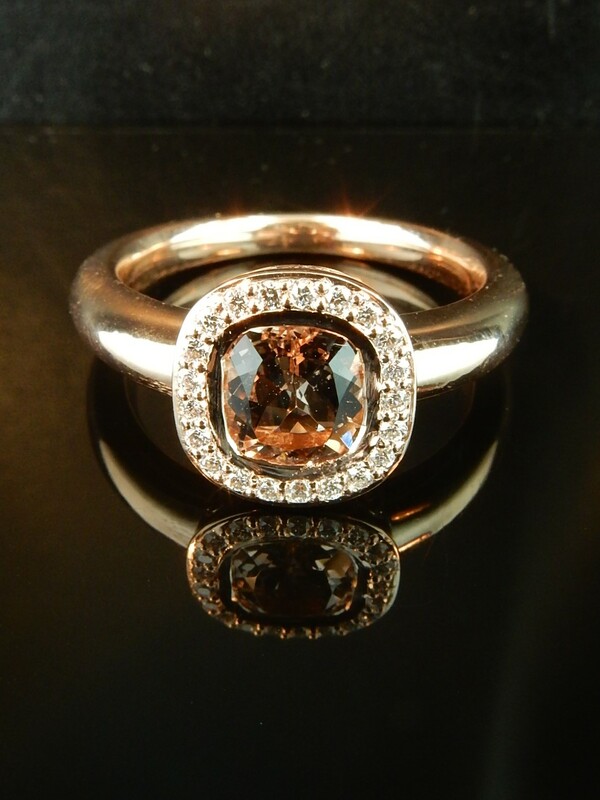 We have just created this custom 14k rose gold ring with a center morganite with a dazzling halo of accent diamonds. This ring features a carefully engraved detail surrounding the head. With a heavy 4.8dwt heft, this ring exhibits the finest quality that our master jeweler and design specialist has to offer! This very cool 18k gold dome ring is a new custom piece that our master jeweler and design experts have meticulously crafted into a modern piece. 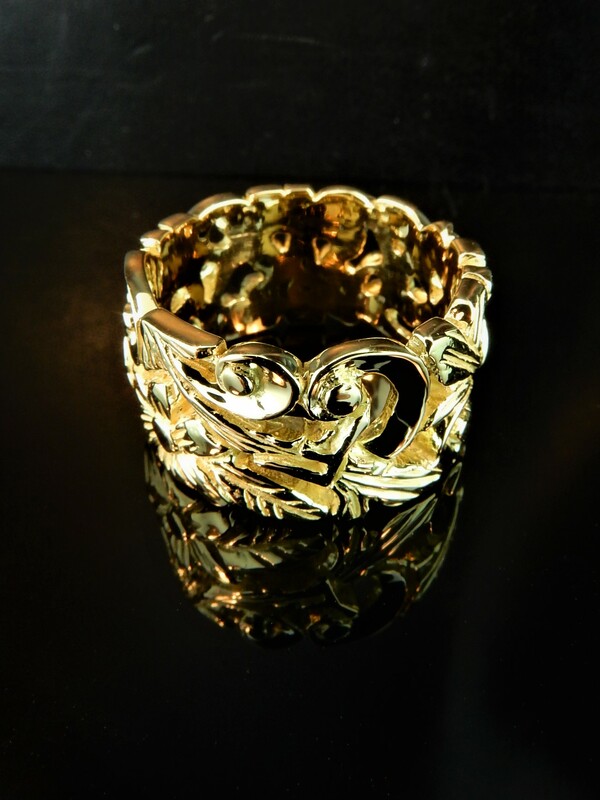 The highly polished gold reflects light in a beautiful way while the heft of this piece reminds you that you are wearing a very solid ring. This is a wonderful option for anyone that likes the look of a larger stone but wants to stay within a budget. This cluster head setting includes nine closely set round diamonds that give the illusion of one larger stone. 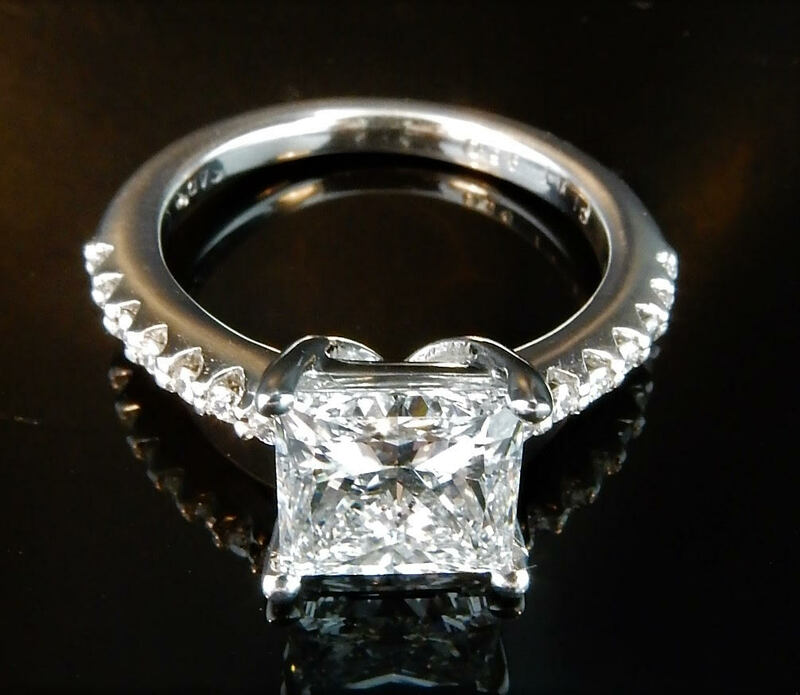 Sizes of diamonds and metal choices can be completely customized to be exactly what you desire! 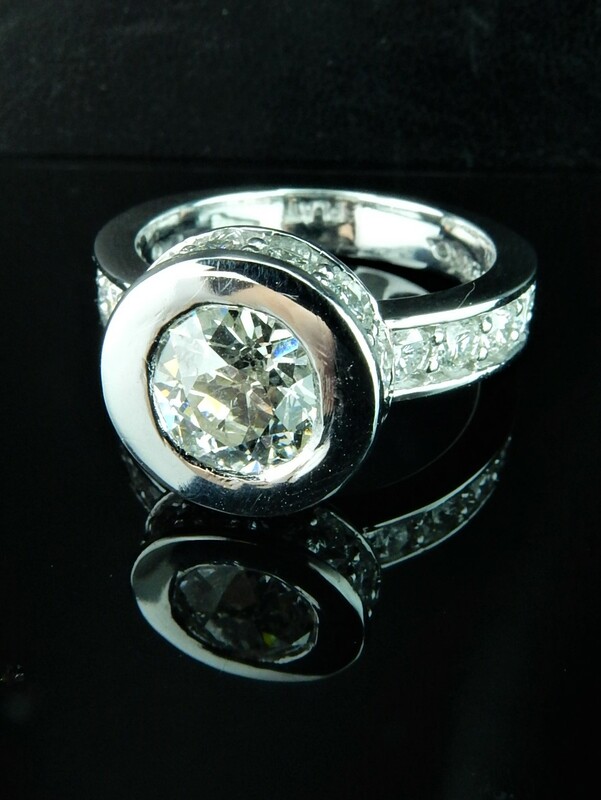 Ferro Jewelers custom made this platinum bezel set diamond ring. Ring features a 2ct. Old Mine Cut diamond and diamonds around the center head and down shank. Customizable for any center diamond. This custom band exhibits a very unique and detailed hand wax carving to start and is finished with a careful and precise 18k yellow gold casting. 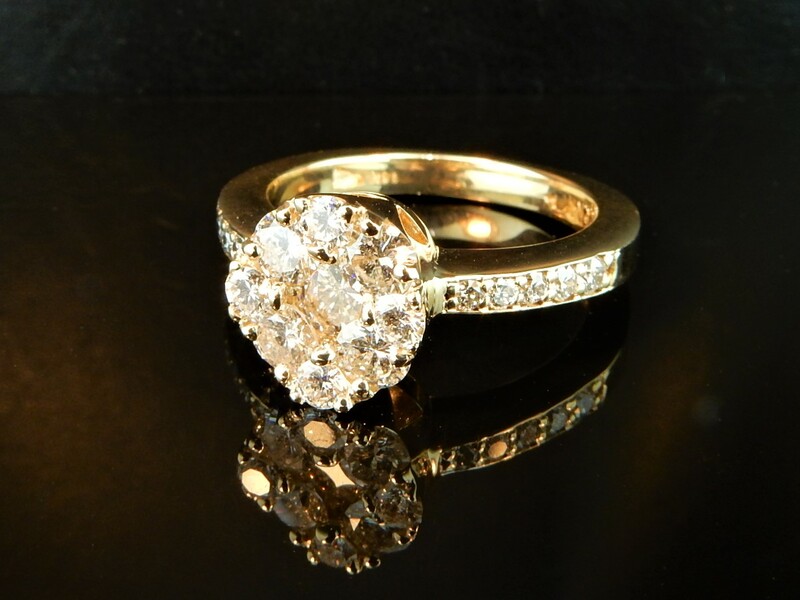 Our master jewelers then added the finishing touches to create this final masterpiece. We can customize this piece to fit your needs so that your final product is meaningful and special to you! We are so privileged to work with such amazing people on a daily basis. We send out a huge thank you to our customers for letting us create such an amazing and meaningful set of jewelry. 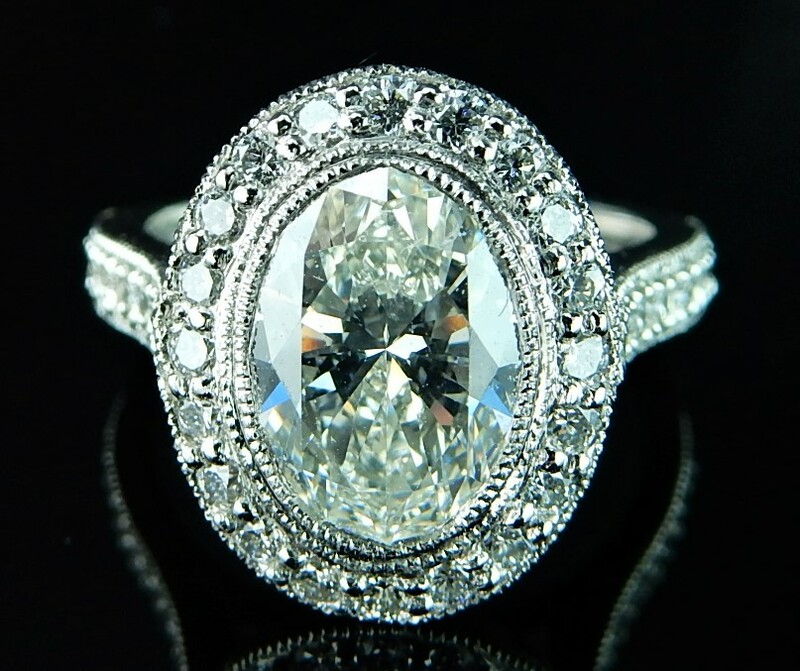 This is a stunning oval cut diamond ring with a halo setting. 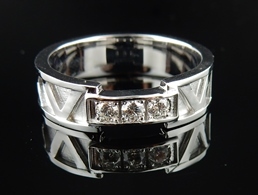 It is complimented with a sparkling diamond wedding band. 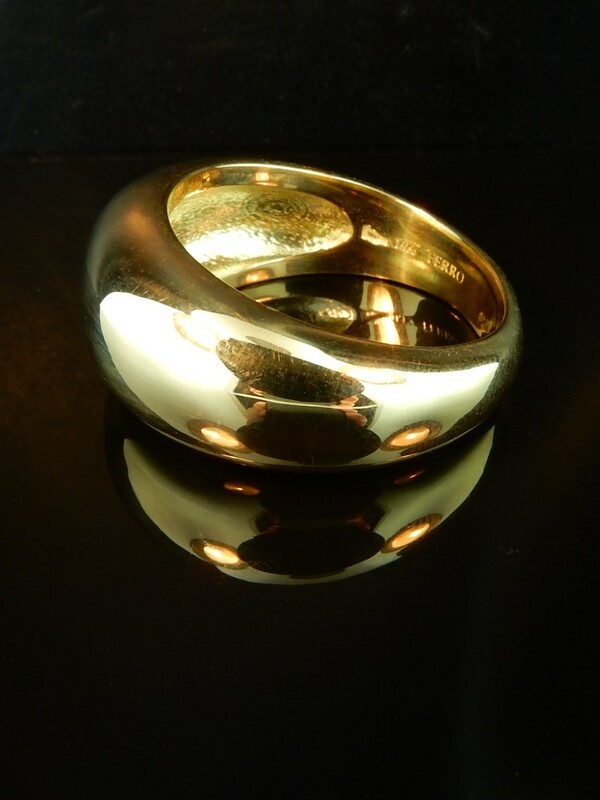 The mens band is created with two toned 14k gold and platinum. 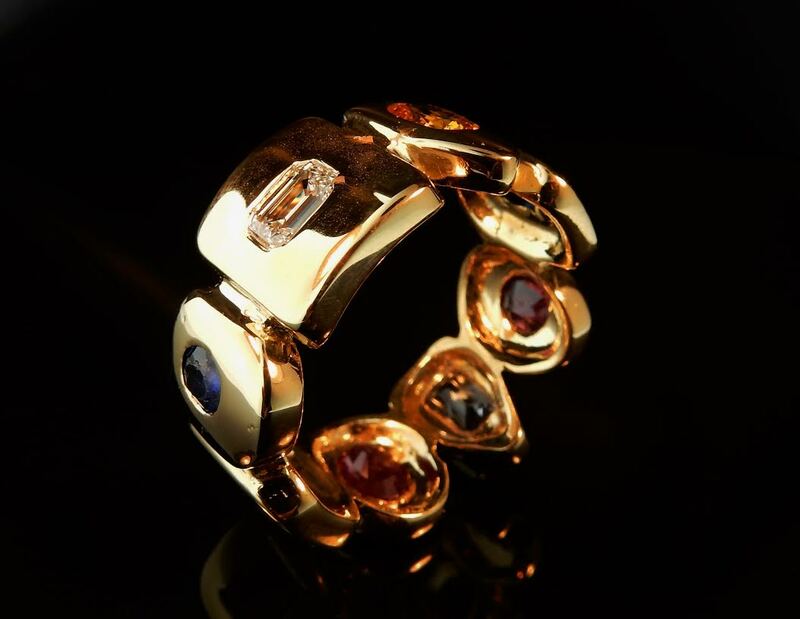 Ferro Jewelers custom created a sectional piece to size this estate 18K yellow gold multi color sapphire ring and ruby ring up from a size 7 to 11. The new sectional piece is in 18K yellow gold and features an approx. .50CT GIA-certified emerald cut diamond. 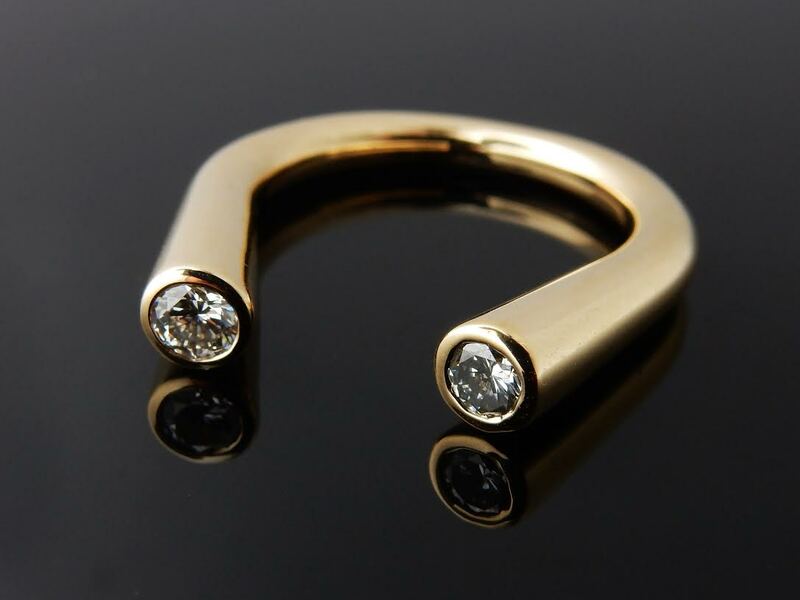 Ferro Jewelers custom made this 14k yellow gold "horseshoe" ring using the customer's diamonds. Available in any metal type and with any gemstone (diamonds or colored stones). Pricing upon request. 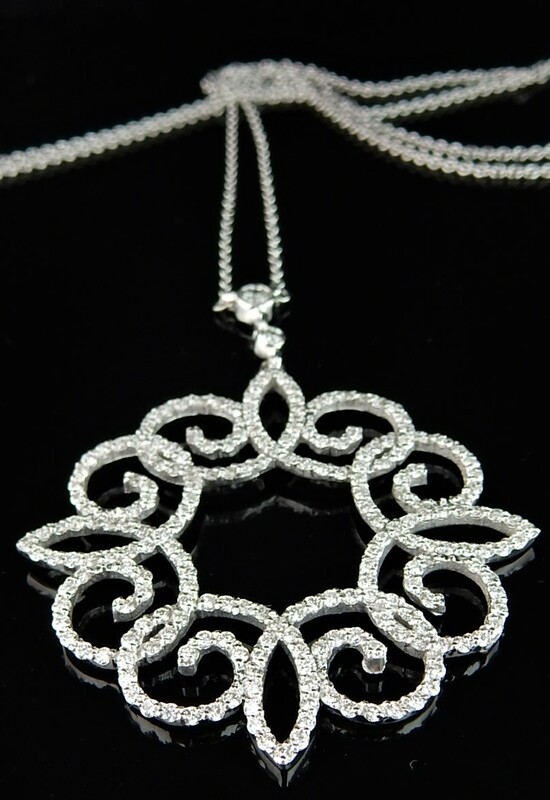 This is a beautiful rendition of a classic style pendant. It features an enormous amount of detail that can only be appreciated in person. It contains all high clarity and color diamonds that total in 1.11TCW diamonds. Designed to look just like Tiffany & Co.'s Atlas Ring, substituting Tiffany's 1-12 Roman Numerals to the customer's Roman numerals of choice. Three round brilliant diamonds, G-H color, SI clarity, .25ctw. Custom Created by Ferro Jewelers.